Warfare is one of the primary ways to obtain territory and other concessions from other nations. The technical aspects of maintaining a military machine and its employment on the field is discussed in-depth in the articles land warfare and naval warfare. Like most diplomatic actions, declaring war requires a diplomat. War may not be declared on an ally, a subject, a guaranteed nation or a nation transferring you commercial power without first breaking that relation. The aggressor may pick a casus belli when declaring war. This determines the wargoal, the options available in the subsequent peace deal, and their associated costs in warscore, aggressive expansion, and diplomatic power. Declaring war without a casus belli will result in -20 aggressive expansion, a -2 drop in stability, and +2 war exhaustion. These penalties are halved with full Diplomatic ideas. A country declaring war on another whose opinion of them is higher than 100 will cause -1 stability and +1 war exhaustion. If opinion is higher than 150, penalty increases to -2 stability and +2 war exhaustion. That country can't call its allies to arms in that war (but its subjects are called as normal). Beware that the Holy Roman Emperor defending the empire is always a co-belligerent. Taking that country's provinces in a peace incurs +50% aggressive expansion and costs +100% warscore. A war consists of two opposing sides of one or more countries. A side may be made up of a coalition, the emperor, allies or the defender of the Faith who honour their treaties and/or vassals and other subject countries. The war leaders are denoted with a star in the war screen. The war leader on the attacking side is the country that declared the war, while on the defending side the leader is the country on which the war was declared (the target of the war goal). For each side in a war the leader is the country that may call in its allies and may negotiate peace on behalf of all their war allies, simultaneously ending the war for everybody. They may negotiate a separate peace with each of the hostile belligerents, except subject nations or coalition members. They may surrender territory of their war allies, but not their treasury. When a war leader is annexed in a separate war, one of their allies will become the new war leader. The new war leader can call their own allies into the war if the war has not lasted long enough to close the window for calling allies to it. If the war leader is vassalized (by event or force) the new overlord will become the new war leader and can call their allies with the same caveat about calling allies to long wars. All nations on the same side in a war will have immediate military access to each other's lands. They may also dock at each other's ports, although their fleet supply range will not be extended. Furthermore, any nation in a war will be able to walk through all nations that have given access to any of the belligerents, even if those are not participating in the war. After a war has started, a country usually cannot join any of the sides unless called in later. There are three exceptions to this rule. The enforce peace action allows for a country to force the attacking war leader to sign a white peace. If the attacker does not accept, the enforce will join the war on the defender's side. Another way to join a war after it has started is for a country to vassalize one of the countries involved in any of the sides. This will drag the new overlord to war as well. Finally, with Rights of Man, a great power may intervene in a war involving at least three other great powers on the side that has fewer great powers. A way of indirectly fighting in a war is for a country to rent out condottieri to one of the countries involved. War may be found on both the land and the sea. See the appropriate articles for more information. War Exhaustion represents the will of a country's population to fight. A high War Exhaustion will sap the ability of a country's armies to fight and reinforce. If the warscore is substantial (66.6%+) and it has been at least 5 years since the war was declared, a country's abstracted population may call for peace. This modifier increases the nation's monthly war exhaustion, beginning at +0.01 per month, and ticks up by another +0.01 per month indefinitely. This means a call for peace will eventually start increasing a country's war exhaustion even if it has a monthly reduction, e.g. from being Defender of the Faith, having the 6th Innovative idea, or having the Kind-Hearted ruler trait. Only human players get call for peace. Call for Peace will also occur if the country fails to submit a peace offer within 3 months of an enemy surrendering unconditionally. In this case the ticking war exhaustion begins at +0.05 per month and increases more quickly. Warscore is the means of measuring whether a war is going in the favor of the aggressor or the defender. It is a common metric used across a number of Paradox Interactive titles, including Europa Universalis III, EUIV, Crusader Kings II, Victoria II, and Stellaris. The scale ranges from +100% (a complete victory for the offending side) to −100% (complete victory for the defending side). Battles won or lost, to a maximum of 40% in either direction. Met war goals. A met war goal will cause war score to gradually tick up for whichever side has met it, to a maximum of 25%. Note that both sides have symmetrical war goals. It is possible for no one to have met the goal; in particular, Show Superiority warscore won't tick if neither side has more than 10% warscore from battles, and a province goal won't tick if a third party (e.g. rebels) controls it. Regiments, ships and buildings can no longer be built in the province, and any unit or improvement building that was underway (including cores and religious or cultural conversion) is immediately halted. 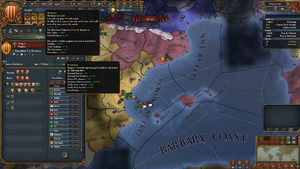 All province income and trade power is no longer given to the owner; a portion of province income and trade power is now given to the occupier. The owner can no longer use the province for a fleet base; any ships currently in the port are forced out to the adjacent sea zone. The controller does have access to these ports. The province does not count for the owner for calculating naval supply, colonial range and trade range. Force limits are unaffected. The controller of the province can recruit mercenaries there. Occupied forts project a zone of control over unfortified land owned by countries that aren't allied to their occupier. Available only with the Art of War DLC or the The Cossacks DLC enabled. Countries can now give up control over occupied provinces to their allies in war. (The ‘transfer occupation’ button is located on the province screen.) This will make it possible to ensure that nations are rewarded for their participation in the war. Administrative efficiency is a country wide bonus that is unlocked at administrative technology level 17 and increases at 23 and 27, up to a total of 30%. Additionally Absolutism provides additional administrative efficiency scaling with amount, up to 40% at 100. Administrative efficiency directly reduces core creation and diplomatic annexation costs, as well as the impact of province development on overextension and warscore cost, allowing for much larger territories to be conquered at once. Peace interface, on the "Demand tribute" tab. This option will open the peace negotiation screen where the country will negotiate their demands, the terms of their surrender or simply a white peace. 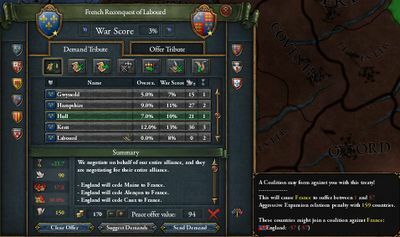 The leader of each war alliance can make peace separately with each independent country on the other side (except any that joined as part of a coalition), in which case only individual warscore against that country and its subjects is taken into account (battles only count towards overall score). This can be essential to get the desired peace deal - the overall warscore may be lower than against a single participant, so the country can get more out of the war by picking off participants one by one. Upon offering unconditional surrender, all of the currently unoccupied provinces will fall under enemy control and the enemy will gain 100% warscore. Armies of the country that surrendered will become exiled and unable to fight in future battles until peace is signed. For the recipient of an unconditional surrender, it will be alerted of the enemy’s surrender and from then on will be able to enforce any possible peace up to 100% warscore cost. If the recipient country does not sign peace after a couple months, they will get call for peace giving them monthly war exhaustion which increases faster than normal. The peace will be automatically accepted by the nation that surrendered. The AI does not offer unconditional surrender. They are however able to accept them. Each term in a peace offer has an associated cost in warscore, Prestige gain/loss for both sides and possible aggressive expansion for anyone making sizable, selfish demands. An appropriate casus belli may modify any or all of these values, and is required to enable certain terms. Annex province Province cost 5 15 The winner annexes the selected province of the loser. It must (eventually, after coring other provinces given in the peace) be possible for the annexing country to core this province, if it is not already a core. It must also not be occupied by a third party; if it is not occupied, it costs 10% more warscore (20% for capitals). If it is occupied by a country other than the one making peace, its current controller annexes it. In a coalition war, members of the coalition may only take cores. AI won't accept giving away unoccupied forts, or unfortified provinces that are near forts if none of them are occupied. 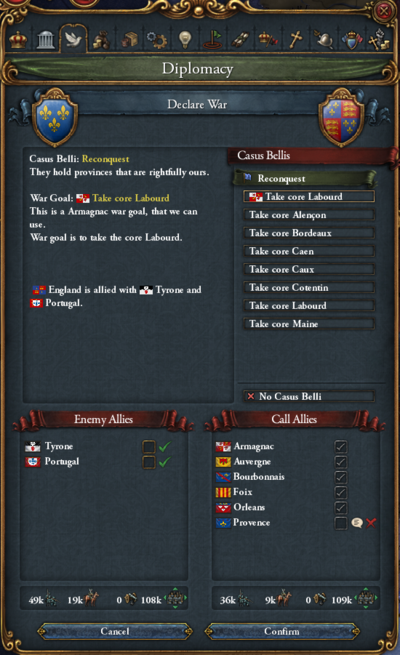 Revoke core Half province cost 1 0 The loser revokes their core on the selected province that they didn't own before the war. Revoking cores of third parties gives them a small relations bonus towards the winner. Never costs diplomatic power. Return core Province cost 1 0 The loser returns the selected core province of an existing country, and loses their core if the province is not of their primary culture. Concede Colonial Area Province cost × 1.33Unconfirmed 5 5 The loser (or their colonial subject) cedes all provinces in the selected area to the winner's colonial subject. Furthermore, for the duration of the truce, the loser may not establish any additional colonies in the region. Give up claims 20% 2 per province 0 The loser revokes all claims on the selected country, who need not be involved in the war. If it's a third party, this gives them a small opinion bonus towards the winner. Cancel subject Half of release nation cost 5 0 The selected subject of the loser becomes independent. Release nation 2% + sum of province costs 1 per province 0 A new nation will be formed out of the loser's provinces with cores of that nation. The new nation will be included in the resulting truce. The new nation will have its capital's religion and culture. The loser also loses their cores except on provinces of their primary culture. Force religion Sum of province costs 10 0 Loser converts state religion to that of the winner. Only possible within the same religious group. Form Personal Union 60% 20 30 Loser becomes lesser partner of a personal union with the winner. Only available with Claim on Throne and Restoration of Union CBs. Become vassal Sum of province costs 1 per 2 development 15 Loser becomes a vassal of the winner. Become tributary Sum of province costs 1 per 2 development Loser becomes a tributary of the winner. Pay tribute 5% per loan 0.5 per loan 0 Loser pays an immediate lump sum of ducats to the winner, measured in amount of loans. Limited to 5 loans, and results in inflation for the winner. Concede defeat 10% 10 0 A "white peace plus", the only change being a larger gain and loss of prestige than other peace deals such as paying gold (±10 instead of ±2). Not compatible with any other terms. Annul treaties 10% 1 0 Loser cancels all treaties (including military access) with the selected country, and is not allowed to sign any new treaties with that country for a duration of 10 years. Royal marriages are unaffected. Change government 50% Loser's government type changes to that of the winner. Only available with Government Type and (unused) Revolutionary War CBs. Transfer trade power 60% 1 0 Establishes a "Transfer Trade Power" relationship from the loser to the winner, amounting in 50% of the trade power in all trade nodes where both countries have trade power. This lasts until cancelled, which the loser can't do until the truce expires. Transfer Trade Power does not occupy a relationship slot. Humiliate 40% 5 0 Winner gains 30 power projection, loser loses 30 power projection. Note that the power projection bonus from humiliating any one rival caps out at 30; and doesn't stack, instead refreshing the bonus. Only available if the loser is the winner's rival. Show strength 100% 0 0 Winner gains 30 power projection + 100 of each monarch power, loser loses 30 power projection and 20 prestige. Note that the power projection bonus from humiliating any one rival caps out at 30; and doesn't stack, instead refreshing the bonus. Only available with the "Humiliate Rival" casus belli. War reparations 10% 2 0 The losing party is forced to pay 10% of their income to the winning party as war reparations. This lasts for 10 years. Revoke elector 60% 5 25 Revoke elector title. Not available if Common Sense is enabled - use the diplomatic interaction instead. Force migrations 100% 2 0 Force a primitive nation to migrate elsewhere. Only possible when the nation is small enough. Enforced military access 15% 0 0 Enforce a nation to give military access until truce expires. Enforced fleet basing rights 25% 0 0 Enforce a nation to give fleet basing rights until truce expires. Enforce rebel demands 50% 2 0 Enforce a nation to accept the rebel demands. Only works with the support rebels casus belli. Note that forming a separate peace can incur a diplomatic power cost, since there is effectively no casus belli when not negotiating with the war leader. Shows distribute spoils in game. Spoils of war are distributed between its participants with prestige and money going to the belligerents of the war based on their war contribution rather than only to the war leader. For example, if Spain and France fight in a war against Great Britain and France gets 70% war contribution and Spain 30% then the prestige and money will be divided so that 70% goes to France and 30% goes to Spain. so a white peace will result in a 5-year truce, whereas a full annexation at 100% war score will produce a 15-year truce. When a country is released in a peace deal, it starts with a 5-year truce with both the releasing nation and the opposing war leader. An example of revanchism from an EUIV developer diary. Revanchism is a mechanic that helps prevent a "death spiral" after losing a war where a country would go bankrupt, lose manpower and have huge revolts, followed by other countries declaring war as well, leading the nation to ruin. Revanchism is gained from losing provinces in a war and scales in direct correspondence to the war score taken in a peace deal, with a max of 100% revanchism at 100% warscore. Once at 100% revanchism it takes 20 years for the effect to fully wear off, lasting longer than the resulting truce that caps out at 15 years for 100% warscore. Releasing nations and returning cores does not grant revanchism. Note that revanchism caps out at 100%, even if a peace deal worth more than 100% warscore in total was taken (such as in multiplayer that allows peace deals over 100% warscore or from multiple peace deals). Human players are largely free to accept or refuse any peace deal. However, as with other diplomatic actions, the AI will accept a peace deal if and only if it has more positive than negative reasons to do so. The warscore is of primary importance. Each point of warscore will give +1 reason for the AI to accept a peace deal, whereas each warscore cost of the peace terms will give −1 reason for the AI to accept a peace deal. Demands exceeding warscore will give additional negative reasons for the AI to accept the peace deal, up to −100 at 99% warscore and lower. Demands exceeding 100% warscore will give −1000 reasons (unreasonable demands, not to be confused with Unjustified demand). Individual demands that would cost over 100% warscore, such as vassalizing a country that is too large, can't be selected. 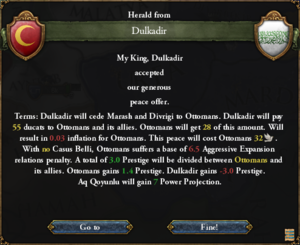 If one side of the war has 100% warscore, the AI is forced to accept any peace offer of 100% or less warscore, including tribute to them. This does not apply to losing human players. Regardless of warscore, the AI may refuse peace deals that contain terms that they do not desire; for example, provinces they will be unable to core. Such offers cannot be submitted (the "Send Demand" button is greyed out). The only exception is stated above, where the AI is forced to take a province they are unable to core if the other side has more than 100% warscore. The local autonomy, size of nation and administration efficiency factors are applied multiplicatively. Other factors also give reasons for the AI to accept or refuse a peace deal. These are summed up as war enthusiasm in the war screen. Positive War Enthusiasm is applied as negative reasons for that country to accept peace deals. Length of war: +45 at start of war, decays by −0.75 at the start of each calendar month thereafter (5 years until it becomes negative). Recent gains: −20 to +20 for war leader only. Colonies and distant overseas provinces are ignored in the calculation above. with the final number rounded to the nearest integer and capped at −20. If war enthusiasm is between 0 and 20 it's classified medium, below it is low and above it is high. If a player refuses a peace offer that entails demands for less than 50% of the current warscore, and the warscore itself is higher than 50%, the declining party takes a −1 hit to stability. When a player is already at −3 stability, any qualifying offer is automatically accepted on behalf of the player. The AI will almost never refuse an offer that would result in a stability hit, so its main area of application is multiplayer games, where this mechanic aims to prevent players from unreasonably dragging out lost wars to harm his/her opponents (by deliberately causing war exhaustion to rise or rebels to spawn). However, if you demand a province in an area where no fort is taken, the AI will refuse it, resulting in −1 stability and −5 prestige. If the AI already is at −3 stability, they will instead lose −10 prestige. ↑ See in /Europa Universalis IV/common/static_modifiers/00_static_modifiers.txt under recovery_motivation(Static modifiers#Revanchism). This page was last edited on 15 April 2019, at 13:21.